H.L. Mencken said, “Define, define, define”. In other words, if one speaker is defining a certain word and the other speaker is taking that same word and applying a totally different meaning to it – this is called, “miscommunication”. The former is frustrated because he can’t get his message across, and the listener? Well, he comes to a different conclusion and the message is corrupted. With proper defining, Newburyport’s claim to fame all depends on the meaning of “clipper”. Everyone has used at some time the common expression, “_____ is going at quite a clip.” Unknowingly, the reader is actually using a seamen’s term “to move rapidly”. This was often extended to “clipper” to describe any ship that moved rapidly through the water. The City of Baltimore was the official home of the Baltimore Clipper, a fast, small vessel that was often used for privateering because it was far swifter than the typical merchant ship that plied the oceans’ waters. In Newburyport’s privateering heyday, many of this style of clipper were often built here and of which, caused such alarm to the British. Later, the English used the term “clipper” to refer to any fast ship that was used to ply the highly competitive tea trade from India and the Southwest Pacific. Many were two-masted and even some early steamships (that had sails too) were also called tea clippers as they sped to get to market in Liverpool. It is this confusion that has some textbooks** assigning the ‘Ann McKim’ as being the first clipper ship with a full three-mast setup. But anyone familiar with what engineers, general public and even seamen know of a clipper ship – would immediately recognize that all the Ann McKim was in design translated into being just an extended Baltimore Clipper. Its sail configuration was more akin to a hybridized barque and certainly did not have the capacity to be an intercontinental merchant ship. This left a great demand for a true, high-speed vessel that could ply the oceans’ waters. Investors and merchants desperately sought a solution to this problem. This left a vacuum that was filled by the team of the McKay’s. Donald had worked in the epicenter of world shipping in New York and had labored in the shipyards, building and maintaining the globe-trekking ships. He would often visit the South Street Seaport with the bows hanging over the street examining and inspecting the American and British designs. Albenia, his wife, was the daughter of a shipyard master and had intimate knowledge of the ins and outs of handling a shipyard. Her father refused to follow the trends of the day which discouraged teaching engineering, mathematics and science to women; and insisted she be schooled in these skills. Donald’s brother, Lauchlan, had intimate day-to-day knowledge on how to manage crews and materials to make sure the ships were built at maximum profit. No one knows exactly when they came up with the design but Donald had been picking up bits and pieces from some of the leading shipbuilders of the day; but by the time he came to Newburyport, he had an idea for a revolutionary new design and knew how to implement it into reality. Donald McKay liked what he saw in this shipbuilding community and found work in the shipyard of John Currier, Jr., then one of the foremost shipbuilders in Newburyport. The ship builder became impressed with the unusual mechanical ability of McKay as the work progressed and how fast the work got done. John Currier, Jr. made McKay an advantageous offer to work for him and to bind him for five years of service, but the offer was refused. McKay wanted to open his own yard. William Currier (no relation to John Currier, Jr.), offered Donald McKay a partnership, and the new firm of Currier & McKay was born on the banks of the Merrimack. It was the first prodigious window of opportunity that opened up for the McKay’s. At the new shipyard, he went about to build the experimental ship, The Currier, named after his benefactor, specifically for the coffee trade coming out of Brazil. He created the first, ‘true’ clipper ship – that same design that can cause such a wonder and joy to the eye when seen in a painting in the full ‘Sail’ position. It was small compared to the monster ‘Super Clippers’ that he would make later but it caused such a ripple in the shipbuilding industry that word spread from London to New York to Baltimore and other ports about this ‘new’ design. More importantly, the investors and merchants took notice and invitations to build at their shipyards began to pour in from up and down the eastern seaboard. Enoch Train, A well-known merchant and ship owner from Boston, wanted to establish a White Diamond Line of Boston-Liverpool packets. He had heard all the talk about the Currier and offered to Donald McKay, his own shipyard in East Boston and the freedom to build based on his designs. This counted as the second prodigious window of opportunity for the McKay’s. Donald took up the offer and the rest is history. 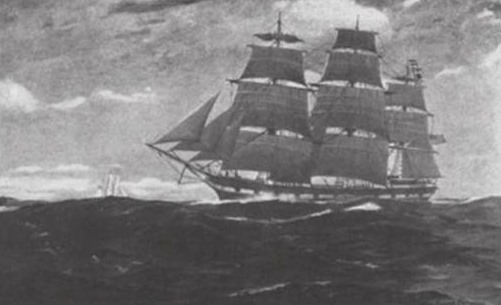 It wasn’t long as competitors wanted to outdo Donald McKay, clipper ships started to be built from Maine to Georgia. The English began to copy the design too and combining with the British thirst for new technologies, even began to improve on the design. Newburyport, like other ports, made a handful of clipper ships though most of the work done along the Merrimack focused on building slow, but high cargo-carrying- capacity vessels. So, why are we called Clipper City? The answer is obvious! Just as the Coast Guard was born in Newburyport – the Clipper Ship was invented right here through the open-minded, entrepreneurial spirit of the Curriers and their ship builder, Donald McKay. PS. To learn fully about the amazing era of the clipper ship, check out the online Clipper Ship Museum. * No wonder that Donald put his family burial site in Oak Hill Cemetery in the City that gave him his start. ** Other textbooks get it right and say the first clipper ship is, ‘The Currier,’ but they claim it was built in Wiscasset, Maine. A little strange since the Currier shipyard is in Newburyport and no Curriers are known to have lived in Maine or had a shipyard there. Clark, Arthur C. / The Clipper Ship Era: Riverside CT: 7 C’s Press, 1910. Cutler, Carl C. / Greyhounds of the Sea: The Story of the American Clipper Ship. New York: Halcyon House, 1930. Duncan McLean: The New Clipper James Baines. The Boston Daily Atlas, Vol. XXIII, No. 53, Friday, September 1, 1854. Reprinted in NRJ Vol. 25, pp 33–35. Helen & Jacques La Grange: Clipper Ships of America and Great Britain: 1833-1869. G. P. Putnam’s & Sons, New York, 1936. Lubbock, Basil (1921). The Colonial Clippers (2nd ed.). Glasgow: James Brown & Son. p. 77. Mary Ellen Chase: Donald McKay and the Clipper Ships. Houghton Mifflin Company, Boston, 1959. This entry was posted in Heritage Tourism, History, Science, Tourism. Bookmark the permalink.